These are the prettiest apricots I’ve seen this year. And they’re just delicious — sweet, a little tart, and perfect in every way. They come from Red Jacket Orchards in Geneva, NY; not exactly local, but in the same state, at least. So, I didn’t begin another Baktus. Not this week, at least. This is Stephen West’s Herbivore. 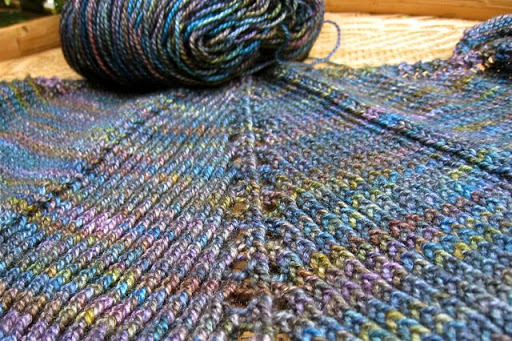 The yarn is String Theory Selku, which is a 50/50 Merino and Silk blend. The color is called Earthquake. I have a couple of skeins that I got at last year’s Knitters Review Retreat, and I don’t think this scarf will take more than one. I know, I’ll save the other one for a Baktus! I've not yet knitted with String Theory. Earthquake makes me think I should rectify this. Gorgeous! 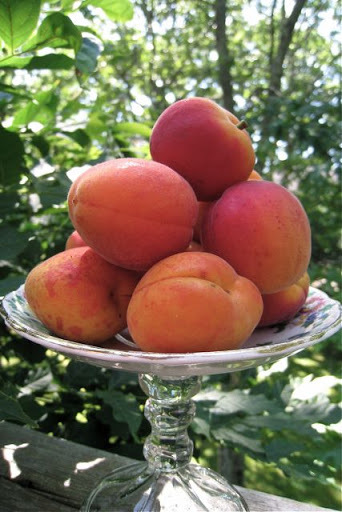 The apricots look tasty, but oh that yarn you're using! Earthquake eh? Looks oceanic to me. Lovely, no matter the elemental association.Love the idea of knitting with string theory. Wow. Love that pattern – just what I've been looking for in a new scarf/shawl pattern. Thanks for the tip! 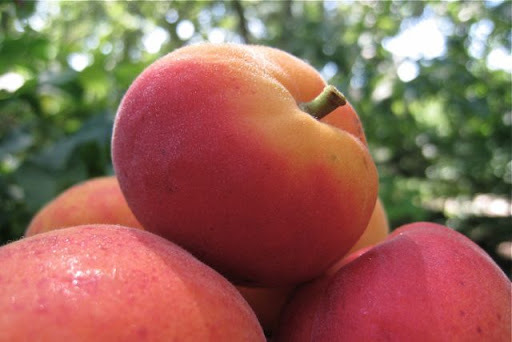 Adding Herbivore to my monstrous queue…Beautiful apricots…one of my favorites, no matter what the preparation (fresh, preserves, dried…just love 'em). Oh, yum. Those have to taste as good as they look! I'm knitting Stephen West's slipped rib scarf at the moment. All his patterns are great for showing off beautiful yarns.